The price of Bitcoin has surpassed £5,000 ($6,649.33) per coin - a new record. 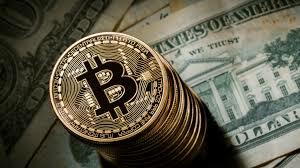 The virtual currency peaked at $6,649.33 (£5,015) at about 16:34 GMT on Wednesday, according to Bloomberg. The total value of Bitcoin in circulation is currently $110bn (£83bn) and the cryptocurrency has risen more than seven-fold against the dollar over the past year. The reason for the latest jump in value was in part driven by an announcement by US-based derivatives marketplace operator CME Group about a plan to launch a Bitcoin futures product before the end of the year. Bitcoin was launched in January 2009. Its value was lower than $100 in June 2013, and below $1,000 as recently as January. But in August, the virtual currency soared to $3,451 after a spin-off - Bitcoin Cash - failed to prove as disruptive as had been feared. And in September, Bitcoin crossed the $5,000 threshold for the first time. "It's been a very innovative year - there have been a lot of new technology platforms for cryptocurrencies, which have lifted Bitcoin," Garrick Hileman a research fellow at University of Cambridge told the BBC. "It wouldn't surprise me if the price were to go even higher." Coinbase - a business that lets the public trade and store digital currencies - reports that it is now signing up between 35,000 to 50,000 new users per day. Mr Hileman said that many people had recently been attracted to invest in Bitcoin because when a "fork" happened in August, investors received an equivalent amount of new Bitcoin Cash coins for free. Another "fork", SegWit2x, is due to happen on 18 November. "Rising geopolitical tensions on the Korean Peninsula are also driving interest in Bitcoin in the surrounding countries, because people are wary of investing in the yen or the dollar," Mr Hileman added. However, he continued, government regulators may crack down on cryptocurrencies, which could drive prices back down.